Chesterfield held on to earn a narrow victory at Rochdale in League One, despite Gboly Ariyibi's late dismissal. Jay O'Shea's placed shot put the visitors ahead, but Ian Henderson levelled with a diving header. Lee Novak restored the Spireites' lead from Dan Gardner's pass and Sylvan Ebanks-Blake then fired in the third. Rhys Bennett nodded in to give Dale hope after Ariyibi was sent off for a second act of simulation, but the hosts were unable to find an equaliser. "As much as I was disappointed with the performance in the first half, the scoreline was retrievable. "In the second half I thought we started superbly well, we got the equaliser and then we just made silly mistakes in quick succession which led to a 3-1 deficit and it was just too much of a mountain to climb. "But I still believe in the players, I still believe in what we're trying to do and it was an entertaining game." Match ends, Rochdale 2, Chesterfield 3. Second Half ends, Rochdale 2, Chesterfield 3. Andrew Cannon (Rochdale) wins a free kick in the defensive half. Foul by Charlie Raglan (Chesterfield). Corner, Rochdale. Conceded by Sam Hird. Thomas Lee (Chesterfield) is shown the yellow card. Goal! Rochdale 2, Chesterfield 3. Rhys Bennett (Rochdale) header from the centre of the box to the bottom right corner. Assisted by Nathaniel Mendez-Laing. Attempt blocked. Calvin Andrew (Rochdale) left footed shot from outside the box is blocked. Substitution, Chesterfield. Emmanuel Dieseruvwe replaces Sylvan Ebanks-Blake. Second yellow card to Gboly Ariyibi (Chesterfield). Gboly Ariyibi (Chesterfield) has gone down, but that's a dive. Dion Donohue (Chesterfield) wins a free kick in the attacking half. Goal! Rochdale 1, Chesterfield 3. Sylvan Ebanks-Blake (Chesterfield) right footed shot from the centre of the box to the bottom right corner. Goal! Rochdale 1, Chesterfield 2. Lee Novak (Chesterfield) left footed shot from very close range to the top right corner. Assisted by Dan Gardner. Attempt missed. Peter Vincenti (Rochdale) right footed shot from outside the box misses to the left. Substitution, Chesterfield. Dan Gardner replaces Jay O'Shea. Foul by Sylvan Ebanks-Blake (Chesterfield). Attempt missed. Sam Morsy (Chesterfield) right footed shot from outside the box misses to the right. Attempt saved. Ian Henderson (Rochdale) left footed shot from the centre of the box is saved in the bottom left corner. Attempt blocked. Ian Henderson (Rochdale) left footed shot from the centre of the box is blocked. Attempt missed. 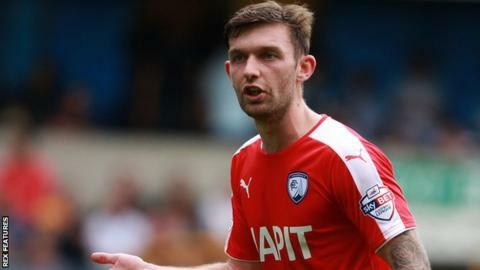 Jay O'Shea (Chesterfield) right footed shot from outside the box misses to the left. Attempt saved. Donal McDermott (Rochdale) left footed shot from outside the box is saved in the centre of the goal. Substitution, Chesterfield. Oliver Banks replaces Chris Herd. Corner, Rochdale. Conceded by Liam O'Neil. Corner, Rochdale. Conceded by Lee Novak. Goal! Rochdale 1, Chesterfield 1. Ian Henderson (Rochdale) header from the centre of the box to the bottom right corner. Assisted by Andrew Cannon. Attempt blocked. Sam Morsy (Chesterfield) right footed shot from the centre of the box is blocked. Attempt blocked. Rhys Bennett (Rochdale) left footed shot from the centre of the box is blocked. Corner, Rochdale. Conceded by Charlie Raglan. Attempt missed. Calvin Andrew (Rochdale) header from the centre of the box is just a bit too high. Foul by Chris Herd (Chesterfield).